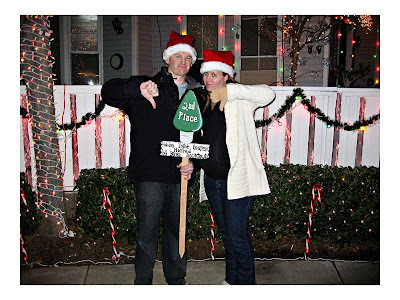 Speaking of my competitive nature, we had our neighborhoods annual Christmas light contest last week. The past two years we've placed second. This year we really weren't planning on going big. We had no theme, we have been super busy working on the nursery, and our weekends have been jammed packed with things for the baby. Also, there's this house in our neighborhood that always goes crazy. 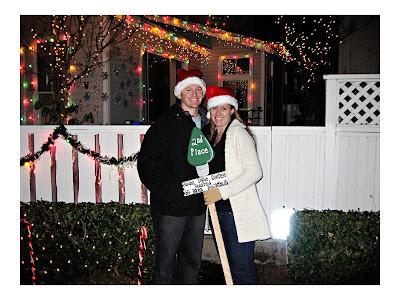 They spend thousands of dollars on their decorations. Last year their theme was Christmas in New York. They had the New York skyline, decorated their windows to look like Macy's, and even had a hot dog cart the night of the contest. It's great that they are so into the contest, but it really doesn't make it very fun for the rest of the neighborhood. No one really tries because everyone knows they are unbeatable. Well, even though I know they are unbeatable, I still have to try. Chuck was up on the roof the night before the contest until midnight putting the finishing touches on our lights. And it was 46 degrees that night too! I wasn't sure we were going to place at all, but we got second... again. But really, second is like first in our neighborhood so we were pretty happy with it. The crazy people made their house into a gingerbread house and had Polar Express playing on one of the walls in their backyard. They also brought out the hot dog cart and added candy apples this year too. Crazy. I want to win, but not that bad. I'm very proud of Chuck for doing such an awesome job on the lights. He pretty much did everything himself this year because I can't get up on a ladder. I'm also proud of him because he went to our neighborhood board meeting and asked them to name the contest after our neighbor Roy who passed away last January. 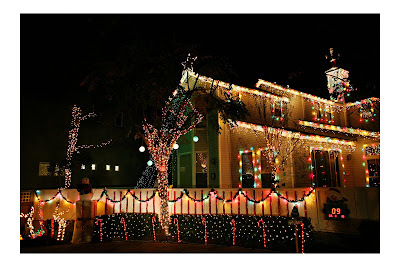 He was super into the contest and would go out in the middle of the night and add more lights to his house. He was the first one to win first place in the contest. Um. WOW. That is CRAZY! How many weeks are you? You are amazing! Can you guys come do our house? LOL - I hired someone and he never showed up so I just said forget it! HEE! So being the blog stalker that I am and fellow wedding photographer. I put together that you lived behind the movie theater and my husband and I went searching for Christmas lights and low and behold there was your gorgeous house!! I cannot believe your man crawled all the way to the top for that dancing Santa but he looked amazing! Good luck with the future parenting and Merry Christmas! So funny that you figured out where our house is! Next year my husband wants our house to be visible from Brea Blvd. He wants to get Santa up even higher! I'm just hoping Santa survives the wind today before we can get him down tomorrow!